View our men's diamond rings here. A century ago, the term "mens diamond rings" would have been considered something of an oxymoron. Well into the mid-twentieth century, it was rare to see any man sporting a diamond ring -- with the notable exception of Liberace, of course. Men's diamond rings were spurned even as wedding rings; most men made do with a plain gold band, so that they could spend more money on their bride's ring (as is proper). But later in the century, as more men began to consider 'bling' a God-given right, men's diamond rings caught on -- not just as wedding ring or an engagement rings, but sometimes as purely personal decoration. Many American men still prefer the minimalist look, which is why one of the most popular styles of men's diamond rings takes the form of a 10-karat gold band sporting a channel filled with baguette-cut diamonds. 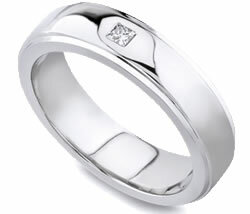 These mens diamond rings are very affordable and are especially popular as wedding rings. They make life simple: they don't tarnish, they don't get caught on stuff, and they don't cost too much. Furthermore, the 10K gold is sturdier than alloys with a higher percentage of gold. With the silvery-gold luster that's unique to this alloy, this men's diamond ring offers a great look without adding any significant complications to one's life. You can, of course, go overboard with mens diamond rings. We've already mentioned the Liberaces and rappers of the world, with their massive men's diamond rings that take a lot of upper-arm strength just to lift. If you're looking for a little flash and have $10,000 in your pocket, consider a style that's starting to get a lot more attention: imagine a pure platinum ring half an inch wide, completely paved with 70-100 small diamonds totaling in the multiple-carat range (and yes, it's a pavé setting). No one who saw such a ring would be able to take their eyes off it. Be careful, though, when you go out in the sun: you might blind someone with a men's diamond ring like this one! If your means are more modest but your tastes aren't, there are always less extreme but nearly as flashy men's diamond rings simply studded with stones, ranging from about $1000 on up. The point is, you can find mens diamond rings of many types, with stones of all sizes. There are men's diamond rings out there suitable as a quiet matrimonial reminder, just as there are mens diamond rings that are much more flashy. Just keep in mind the four Cs of diamond shopping -- cut, clarity, color, and carats -- and you'll be fine. If you do need assistance with finding the right mens diamond ring you can always give us a call toll free at 1-877-877-4141. We are always ready to help you.